The Los Angeles Chargers have scuffled to 0-3 and are looking at a must win game against the 2-1 Philadelphia Eagles. 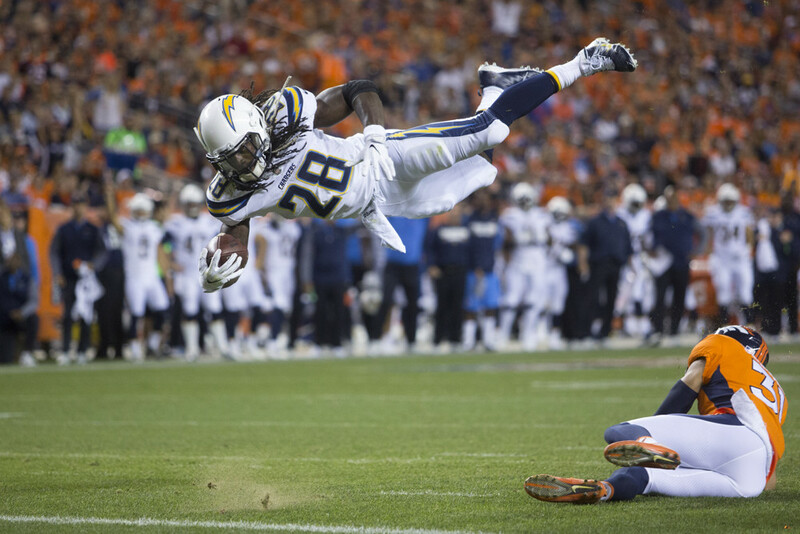 The Chargers don't have the look of an 0-3 team, but late game errors have cost them dearly. On the flip side, the Eagles used a last gasp 61 yard field goal to escape New York with a win. Don't be surprised if the Chargers spring the upset with the Eagles traveling across the country for a late start. After back to back big weeks for Phillip Rivers, the bottom fell out. Most of this was thanks to an aggressive Kansas City defense, but Rivers was all over the map with his throws. The Eagles defense is giving up the eighth most passing yards in the league and is definitely exploitable, so consider Rivers a fringe QB1 and major bounce back candidate. Melvin Gordon suffered a bone bruise last week but expects to be a full go this week against the Eagles. Additional bad news is the Eagles stout front 7 which is yielding only 75 rushing yards again. Still, Gordon has scored in every game this year, and has one of the highest touch rates in the league. He is a RB1. Keenan Allen looks fully healthy from his ACL tear last year, and he has Phillip Rivers' complete trust. A plus receiver in PPR formats, Allen has the 5th most targets in the league with 29 and should put together a solid week against a beatable Eagles pass defense. With the return of number one option Keenan Allen, Tyrell Williams' opportunities have been significantly reduced from last year. Because of that he is more of high floor Flex option then anything else. Still he has 19 targets so far this season and has a higher ceiling against the Eagles pass defense. After a quiet first two weeks, Travis Benjamin put together five catches for 105 yards against the stingy Kansas City defense. Benjamin is the team's deep threat which makes him a risky fantasy play, but he is worth a look in deeper leagues. While the Giants as a whole are pretty laughable, their defense remains stellar, so don't fret about Wentz's low output last week at home. That being said, he faces another difficult test against the Chargers, who are only allowing 176 pass yards a game so far this year. Look for the Chargers to provide more opportunities for the Eagles running backs and less than 30 passes for Wentz. Keep him on the bench. With target totals of 7,13, and 8, Jeffrey represents a solid WR2 in the Eagles offense. He will be dueling a strong secondary this week but is still startable and provides a high floor. Just don't expect a huge day. Your target leader for tight ends through three weeks is Zach Ertz with 28. And Ertz is making the most of those opportunities, catching 21 balls for 245 yards. The Chargers did an excellent job shadowing Travis Kelce last week but Ertz's volume makes him a no brainer TE1. The main beneficiary of the Darren Sproles injury (good night sweet prince) is Wendell Smallwood, who should inherit the majority of Sproles' passing touches. Considering he saw the most rushing touches last week as well, he has a positive outlook for the rest of the season. However, the Chargers have a strong front, and it might be wise to wait a week or two to see how the touches play out. He is a desperation flex play. LeGarrette Blount got back into the end zone again against the Giants, only one week after not touching the rock a single time. That is how Blount has been and probably will be for his entire career. He is worth a look as a flex but represents the ultimate touchdown dependent boom or bust play.